The Advanced Class Guide is one of the biggest releases for the Pathfinder Roleplaying Game in years. Find out all about it from the Pathfinder design team. Featuring Jason Bulmahn, Stephen Radney-MacFarland, Mark Seifter, and Logan Bonner. 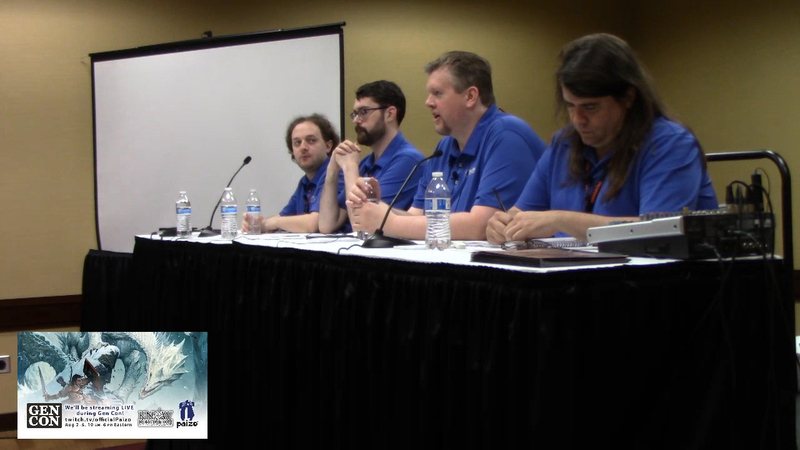 The Pathfinder design team -Jason Bulmahn, Stephen Radney-MacFarland, Mark Seifter, and developer Logan Bonner- talk everything RPG-related that we know about for 2014 and 2015: Monster Codex, Strategy Guide, Pathfinder Unchained, and Occult Adventures (with guest speaker Brandon Hodge). Know Direction 198 LIVE – How Cartoons Can Make Your Game Better! The Know Direction Network is your premier source for Pathfinder audio content, and more. Our Flagship podcast, Know Direction, is the number one source for Pathfinder News, Reviews, and Interviews, as well as convention coverage! Always stay informed with the latest Pathfinder info. LIVE twice monthly. The Private Sanctuary focuses tight on game topics, going in depth on the rules, classes, features, and running of the game. Geek Together is where we get our nerd on. From TV, movies, comics, and cartoons old a new, tune in to enjoy our shared geek culture. And of course we have original articles and content posted regularly for your reading pleasure as well!